positivemed.com | Coconut Oil has been lauded as the miracle oil – a super food good for everything from salad dressings to morning smoothies. It’s been shown to soothe improve digestion and metabolism as well as reducing cholesterol and increasing energy. But coconut oil needs a prominent place in your bathroom as well as your kitchen. Many people are discovering the benefits of coconut oil for hair cosmetic health such as soothing rashes as well as conditioning hair and skin. Now, toothpaste gets a big overhaul with nature’s miracle oil, too. Coconut oil has been known to boost the immune system, fight infections, support organ health – all benefits that also translate to oral health. Swishing coconut oil around in your mouth daily, a technique called oil pulling, also helps to remove toxins from the mouth and body. Incorporating these health benefits to your daily routine will lead to healthier teeth and gums, fresher breath, and will decrease toxic side-effects of commercial toothpastes. 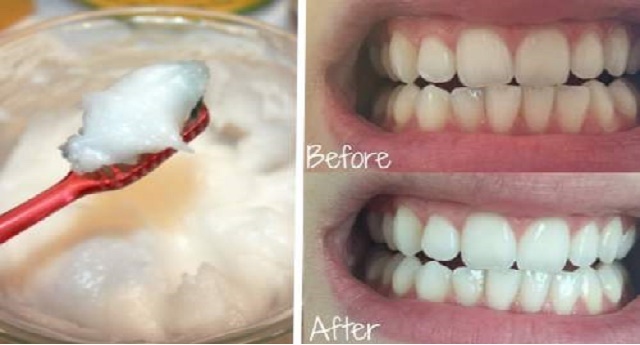 Coconut oil toothpaste is easy and inexpensive to make. It only requires a few ingredients to make enough for several uses. -Prepare and clean a small jar with a tight lid. A baby food jar or small Mason jar will do. -Mix 1 part Coconut Oil with 1 part Baking Soda. -Add 3-5 drops of Sweet Orange, Peppermint, or other food-grade essential oils to flavor. -Allow your paste to cool and set. Then simply apply this paste to your toothbrush and brush your teeth as you normally would. Coconut oil on its own can also double as a refreshing mouth wash in between brushing. This homemade coconut oil toothpaste will clean and whiten your teeth, with the baking soda adding a gentle abrasive agent. It will help fight gum disease and tooth decay. The health quality of this miracle oil means your teeth get powerful detoxifying paste without the harmful chemicals found in regular toothpaste.